The Milwaukee Art Museum may have a small collection of ancient Mediterranean art, but we have some great pieces! Take, for instance, our two ancient Greek Hydria. Walk into Gallery 1, and you will see them in the free-standing case on the right. What is so exciting about Greek vases? Well, for one thing, they are some of the only artwork that we have remaining from this important ancient civilization. In particular, their decorations are the only hint that we have of what ancient Greek painting looked like. Practically all ancient painting has been destroyed due to its fragility. Greek vases survived because they were put into tombs and sanctuaries as offerings. In fact, the accident of their survival has made them more important to us than to the Greeks, who for the most part did not seem them as great art and used them as everyday objects. Also, Greek vases often show scenes related to mythology and can be a great way to learn how to identify the gods and heroes of the ancient world. Other vases show special events or everday activities that give us insight into the world of the ancient Greeks. Our hydria would have held water (think hydration—the Greek word for water is the root for this English word). A rope could be strung through the two side handles for drawing water from a well or pool and also for carrying it, and the single handle on the back would be for pouring like a pitcher. The wide lip at the top was designed to stop drips. What is really exciting about the Museum’s hydrias is that they offer a perfect way to compare two different ancient Greek decorating styles, in person, on actual ancient objects. For instance, one hydria is in “black-figure” and the other is in “red-figure.” You can probably guess which is which. Both styles use the same “paint,” called slip, which is a glaze made from clay. But they use it in very different ways. In black-figure (above right), the slip is used to fill in the figures so that the details have to be scraped into the slip to show the red clay behind. Details in white and red paint might also be added after firing. The resulting silhouettes create a stiff, static figure. Also, overlapping objects is extremely difficult, as you can see from the two figures on the left—the scraped lines become a jumble. 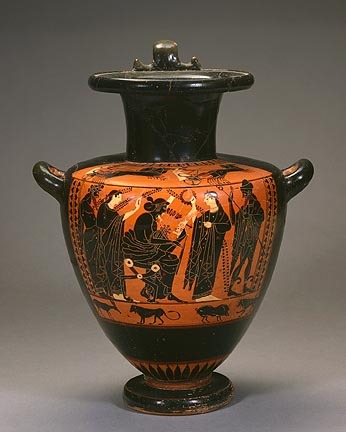 Also typical of black-figure vase paintings is a stage-like setting, often in a box, on one side of the vase. The black-figure technique reached its height in Athens during the late 6th century BC, which is when our hydria was painted. Our black-figure vase shows an assembly of gods and not a specific myth. Recognizable by their attributes, Dionysus appears on the left with his long robe and beard; a youthful Apollo is seated in the middle with flowing hair and a lyre; and Hermes, on the right, is outfitted in his short cloak, winged boots, and traveler’s hat. The two women may be Artemis and Leto, Apollo’s sister and mother. Notice that if Apollo stood up, that he would be a full head taller than the other figures! This use of scale shows that he is the most important figure in the scene. Red-figure vase paintings are created in a manner opposite to black-figure. The figures are outlined and the background is colored black. Rather than inscribing details with hard tools, the artist could use brushes to add details, which gives drapery, anatomy, and faces a more naturalistic appearance. Emotions and action were also easier to show. Just compare the overall appearance of these two vases, and you can see how freeing the red-figure technique is. There is more movement in the figures, who run across the ground line, and they are not constrained to the box on the front of the vase and fill the widest point on the vessel all the way around. The red-figure technique was developed in Athens during the late 6th century BC, but did not become dominant until after 500 BC. Our red-figure hydria (above left) was painted ca. 460 BC by the Niobid Painter. We know few personal names of Greek vase painters, so these anonymous artists are often given names related to a specific vase in their style. The Niobid Painter is named after a famous vase in the Louvre. In contrast to the scene on the black-figure hydria, the red-figure hydria has a narrative myth. Boreas, the north wind, is abducting Orithyia, daughter of the legendary Athenian king Erechteus. You can recognize Boreas on the left from his wings. Orithyia runs off the scene to the right. Meanwhile, Athena stands in the middle (larger, again, because she is the most important figure in this scene), calm and resembling a column, holding her hand up in an attempt to make Boreas stop. Athena is the patron goddess of Athens, so she is trying to protect the daughter of the king. 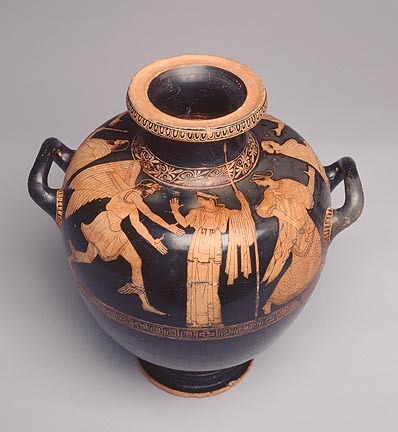 On the back of the vase, friends of Orithyia run to tell Erechtheus what has happened to his daughter. So the next time you are entering the permanent collection galleries, stop and take a peek at the two ancient Greek hydrias. These 2,500 year-old treasures pack a lot of information! This entry was posted in Art, Curatorial and tagged Ancient Art, From the Collection, Greek Art. Bookmark the permalink.